As I was sewing suits this week I remembered a couple more items that I should point out. Click HERE for the posting of my first set of tips. 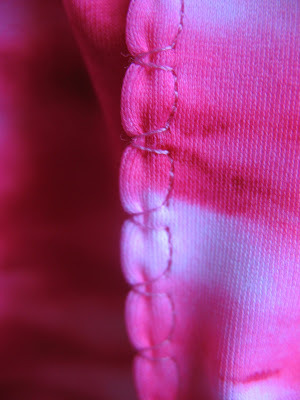 I use one of two decorative stitches for topstitching down the elastic in swimsuits. You attach the elastic on the wrong side of the swimsuit with a loose zig zag and then as you fold it in towards the inside of the suit you finish it off with one of the two stitches below. Katelyn asked me on the last post if I would show a pic of what I meant by "loose" zigzag stitch. I hope this helps. On my machine my stitch length goes from 1 to 4. I normally sew on about a 3. For basting or gathering I move the stitch length to 4. So as I zigzag I leave it on a stitch length of 3. That is what is shown below. Those black lines are a 1 inch grid on my cutting board. This picture shows what it looks like if I adjust the stitch length to almost a 2. It is way too close together. Here is a little side by side comparison. #1 The Three Step Zig-Zag (My preferred choice!!) Here shown on a neck edge of a swimsuit. 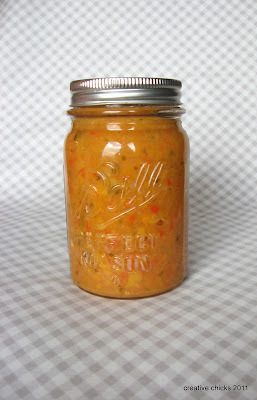 I use this on the hem of the ruffled skirt on the swimsuit or cover-up skirt. It can also be used on the hem edges and sleeve hems of t-shirts. To make it you set your machine to it's shell stitching setting (blind hem stitch). 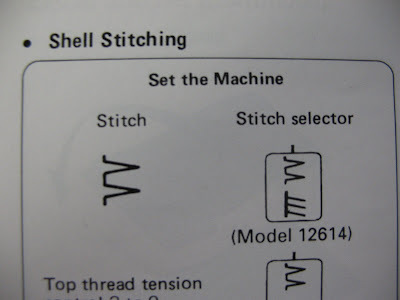 If you have your machine's manual look in the index for "Shell Stitching". Play around on a scrap piece of fabric first because picking this stitch out is NOT fun. And some fabric will "shell" a lot easier than others so you'll have to adjust your stitch lengths. The Shell Stitch is formed by sewing a blind hem over a folded piece of fabric. You may need to tighten the top thread tension slightly. 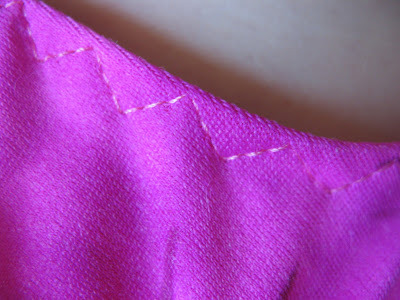 Allow the needle to just clear the folded edge of the fabric when it zigzags. 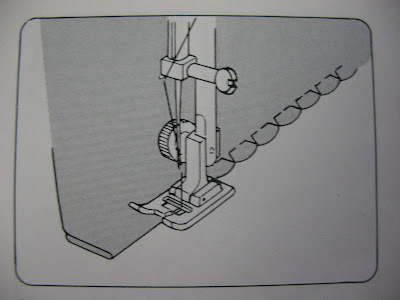 Also, make sure you have plenty of bobbin thread before starting this. If you run out mid-hem it is not as easy to match up as you would think. If you have any other questions, send them our way. If we know the answer we'll try and explain it. If not, we'll see if we can find it somewhere. That is one thing about sewing--there is more than one way to do something.